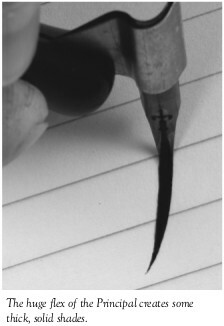 In some of the most exciting nib news in more than a century, D. Leonardt & Company, a steel pen maker located in Shropshire, England, has introduced the Principal, a nib that successfully reproduces the venerable Principality. 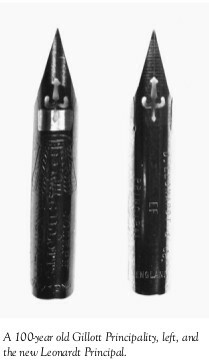 A remarkable bit of engineering, Leonardt has re-created the super-fine Principality point and its superb flex to make what is in the author’s view the finest nib manufactured today. IAMPETH’s own master penman, Brian Walker, deserves the lion’s share of the credit for convincing Leonardt’s chairman, Nick Stockbridge, that the Principal would be a worthwhile investment. Together, they made the nib a reality. The Principality, originally manufactured by Gillott in the latter half of the 19th century through to World War II, was the hands down favorite of Madarasz, Courtney, and other past master penmen. Zaner and Bloser commissioned Gillott to clone the Principality as the Zanerian FineWriter. Frederick Tamblyn did likewise with the Tamblyn #7. 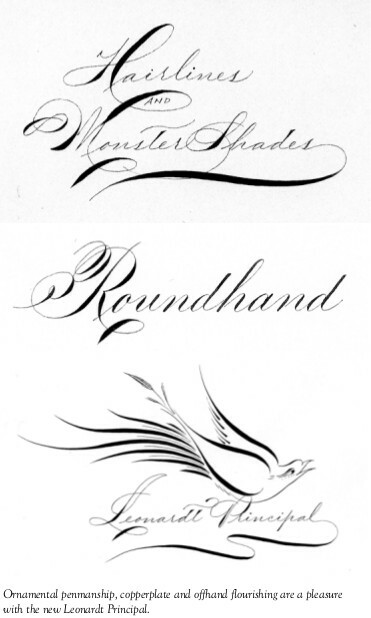 Both the Spencerian Pen Company and Hunt also copied the Principality as the Spencerian Artistic #14 and the Hunt Imperial 101. The latter is still made. Like the old Principality, the Principal can make the finest hairlines with thick, solid shades. For writers of ornamental pen manship, copperplate, or engrosser’s script, the news could not be better. The considerable flex and snap—the ability of the a nib to flex its tines and quickly return to its original position—of the Principal is everything any penman could want.